I finished 2 ornaments today. Top is from Prairie Schooler, stitched on 30 count Linen with DMC threads. 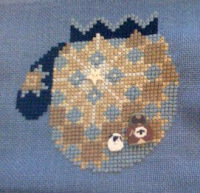 Bottom is from the book 'Beaded Cross Stitch Treasures' by Gay Bowles. Stitched on 28 count Linen with Mill Hill Beads & DMC threads. This was one of the few SAL scheduled weekends where I was actually not scheduled to work so I took advantage of that and stitched "Heartfelt Harvey" designed by Imaginating, Inc.. The design is from JCS 2008 and was inspired by a style called redwork aka turkeywork. I did not have enough red in my mystery thread pile to do the whole design in one single colour so I played around with the thread and fabric colour. 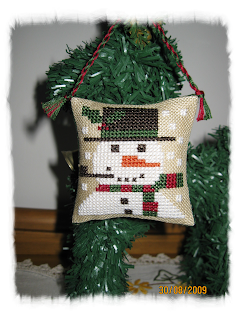 It has been ages since I stitched a Christmas ornament. 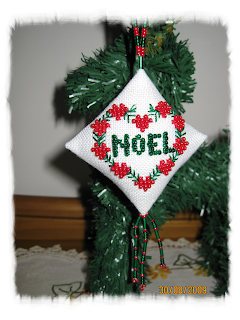 The scheduling gods had me working this past weekend (New Brunswick Day long weekend) so instead of laying on the beach and drinking around an evening bonfire, I worked all day and stitched this ornament in the evenings. Here is my version of Elf in the Box from the JCS 2009 Christmas ornament preview issue. I changed the colours around, depending on what I found in my mystery thread box and used some decorations that I had in my stash instead of making the perforated paper designs. Perforated paper is one of my least favourite things to stitch on so I used these snowflakes instead!